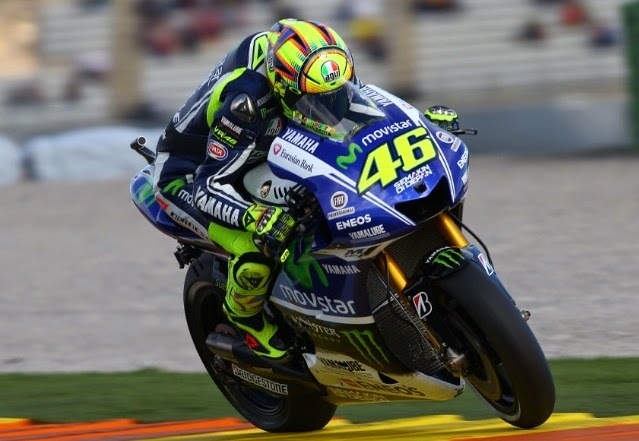 Valentino Rossi has taken his first MotoGP pole position since 2010, during the final qualifying session of the season at Valencia. The result was especially surprising since the Yamaha star had struggled throughout practice, managing no higher than fifth. But The Doctor pulled pole out of the bag by edging 0.132s ahead of countryman Andrea Iannone Ducati's on his very final lap. Iannone's performance was also unexpected given his arm injuries last time at Sepang. Dani Pedrosa completed the front row qualifiers on a day when Repsol Honda team-mate and reigning champion Marc Marquez saw hopes of pushing his pole record to 14 end with a fall in the closing minutes. Marquez still has the chance to become the first ever MotoGP rider to win 13 races in a season on Sunday, when he will start from fifth on the grid, just behind Rossi's team-mate Jorge Lorenzo. Rossi is seeking to defend a twelve point advantage over Lorenzo for second in the world championship. Pol Espargaro claimed the final place on the second row after getting the better of Monster Yamaha Tech 3 team-mate Bradley Smith. Fellow Englishman Cal Crutchlow will start his last race for Ducati from eighth after outpacing GP14.2 team-mate Andrea Dovizioso. Stefan Bradl (LCR Honda), Aleix Espargaro (Forward Yamaha) and wild-card Michele Pirro (Ducati) rounded out the Q2 riders. Suzuki will start its first grand prix since 2011 from 20th on the grid with wild-card Randy de Puniet, who suffered a second technical problem in final practice. The other new machine on track - a 2015-spec Honda RC213V-RS for Hiroshi Aoyama - starts 18th after also not progressing beyond Qualifying 1 [Crash].